The United States secretly tested chemical and biological weapons on American soil during the 1960s, newly declassified Pentagon reports show. The tests included releasing deadly nerve agents in Alaska and spraying bacteria over Hawaii, according to the documents obtained Tuesday. The United States also tested nerve agents in Canada and Britain in conjunction with those two countries, and biological and chemical weapons in at least two other states, Maryland and Florida. The summaries of more than two dozen tests show that biological and chemical tests were much more widespread than the military has acknowledged previously. The Pentagon released records earlier this year showing that chemical and biological agents had been sprayed on ships at sea. The military reimbursed ranchers and agreed to stop open-air nerve agent testing at its main chemical weapons center in the Utah desert after about 6,400 sheep died when nerve gas drifted away from the test range. But the Pentagon never before has provided details of the Alaskan, Hawaiian, Canadian and British tests. The Defense Department planned to formally release summaries of 28 biological and chemical weapons tests at a House Veterans Affairs subcommittee hearing Wednesday. The documents did not say whether any civilians had been exposed to the poisons. Military personnel exposed to weapons agents would have worn protective gear, the Pentagon says, although the gas masks and suits used at the time were far less sophisticated than those in use today. The head of the House Veterans Affairs panel called for further investigation of the tests. "Our focus must be on quickly identifying those veterans who were involved, assessing whether they suffered any negative health consequences and, if warranted, providing them with adequate health care and compensation for their service," said Rep. Chris Smith, a New Jersey Republican. The tests were part of Project 112, a military program in the 1960s and 1970s to test chemical and biological weapons and defenses against them. Parts of the testing program done on Navy ships were called Project SHAD, or Shipboard Hazard and Defense. 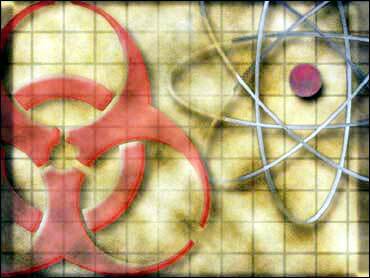 The United States scrapped its biological weapons program in the late 1960s and agreed in a 1997 treaty to destroy all of its chemical weapons. Some of those involved in the tests say they now suffer health problems linked to their exposure to dangerous chemicals and germs. They are pressing the Veterans Affairs Department to compensate them. Earlier this year, the Defense Department acknowledged for the first time that some of the 1960s tests used real chemical and biological weapons, not just benign stand-ins. The Defense Department has identified nearly 3,000 soldiers involved in tests disclosed earlier, but the VA has sent letters to fewer than half of them. VA and Pentagon officials acknowledged at a July hearing that finding the soldiers has been difficult. Devil Hole I, designed to test how sarin gas would disperse after being released in artillery shells and rockets in aspen and spruce forests. The tests occurred in the summer of 1965 at the Gerstle River test site near Fort Greeley, Alaska. Sarin is a powerful nerve gas that causes a choking, thrashing death. The Bush administration says it is part of Iraq's chemical arsenal. Devil Hole II, which tested how the nerve agent VX behaved when dispersed with artillery shells. The test at the Gerstle River site in Alaska also included mannequins in military uniforms and military trucks. VX is one of the deadliest nerve agents known and is persistent in the environment because it is a sticky liquid that evaporates slowly. Iraq has acknowledged making tons of VX. Big Tom, a 1965 test that included spraying bacteria over the Hawaiian island of Oahu to simulate a biological attack on an island compound, and to develop tactics for such an attack. The test used Bacillus globigii, a bacterium believed at the time to be harmless. Researchers later discovered the bacterium, a relative of the one that causes anthrax, could cause infections in people with weakened immune systems. Rapid Tan I, II, and III, a series of tests in 1967 and 1968 in England and Canada. The tests used sarin and VX, as well as the nerve agents tabun and soman, at the British chemical weapons facility in Porton Down, England. Tests at the Suffield Defence Research Establishment in Ralston, Canada, included tabun and soman, the records show. Tabun and soman are chemically related to sarin and produce similar effects.